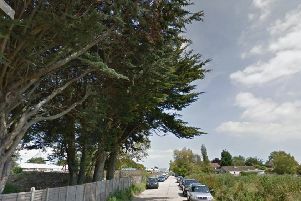 Police are appealing for witnesses to a burglary at a house in Park Avenue, Shoreham, on Saturday, August 6. A man forced his way into the rear of the property at about 4.30am and made off with a quantity of cash, and was seen leaving the premises. The incident occurred while the owners were away. The suspect is described as a white man wearing shorts, light coloured trainers and possibly carrying a jacket. PC Gavin Percival said: “If you were in the area at the time and saw anything suspicious, or know who is responsible, please get in touch. Witnesses are asked to contact 101@sussex.pnn.police.uk or call 101, quoting serial 272 of 06/08.